Smiley has revealed the latest in a long line of upscale fashion partnerships as it teams with the prestigious outerwear brand, Moncler. Together, the pair will develop an exclusive winter capsule collection of rugged outerwear, apparel and accessories featuring Smiley’s signature bold yellow palette and iconic Smiley icon. 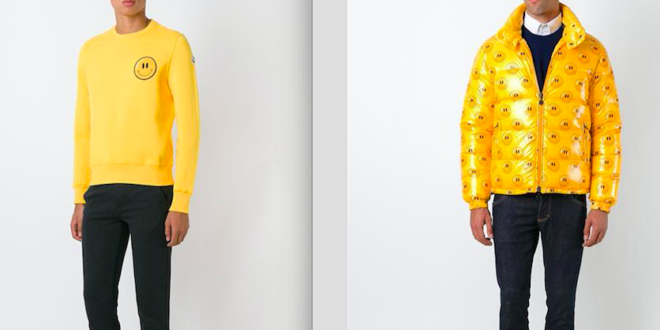 The newly launched range of outerwear features Smiley’s trademark all over prints, as well as contemporary sweaters in bold yellow. Smiley CEO Nicolas Loufrani, said: “I am delighted to be collaborating with one of the world’s leading technical outdoor sports brands. Moncler now joins a growing list of collaborations for the Smiley brand that features the likes of Fendi, Joshua Sanders, Moschino and Anya Hindmarch.